You will then see these tabs at the top of your account. The important button is the one I have put an arrow to – the + sign. That is what you need to click to be able to change the layout. The default is to select the 3 shown but you can also have categories for updates and forums as you can see. If you remove the tick next to the Social and Promotions then you will go back to your old layout. The primary category is always on, by the way. If you are like me you get into a habit of scanning your emails to look for the important ones only. This new layout is making that harder for me to do and so I wanted the old layout back. The other thing about this is that I have to trust Google to work out whether my email is social, promotion or a primary one. I haven’t read anything about how they plan to do this but I like to decide myself what type of emails I get! From the little I have seen it seems that any message from facebook, twitter, google plus or other social network will automatically go into the social category – makes sense. Promotions is a little more difficult to work out. If you are a subscriber to someones email series then I had wondered if it would appear in this category but it seems not. Google has mentioned that Multiply News, Google+ Team and Wetpaint are likely to go into promotions. I think this category is the most difficult for Google to determine and perhaps the one that people will want to remove because sometimes emails that are from a typical promotional account can in fact provide very helpful information and not what you would consider promotional. This should be quite straight forward. Discussion groups, online communities and any other online group you belong to. 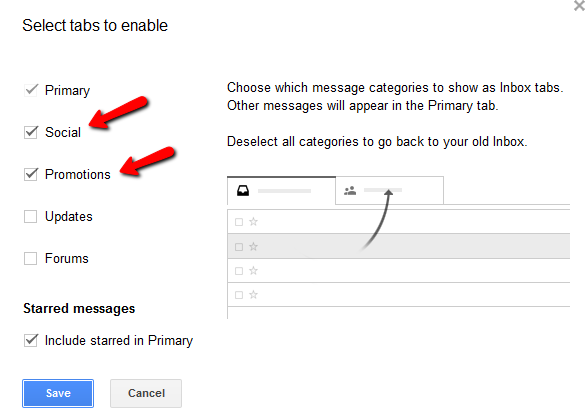 However, Google has also put mailing lists under this category. Any update email such as password updates, any account update , even social media ones – so those particular emails would not go in the Social category. I prefer to use filters and label my emails but I am sure there will be some people who welcome this new layout.